It’s easy to spend a small fortune recreating the classic motorcycle ‘look’. 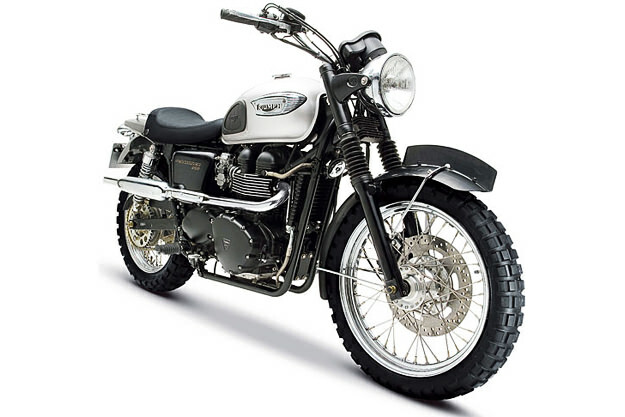 But some relatively new bikes will give you a head start, and the Triumph Scrambler is one of them. The machine above was lightly modified for Mission Impossible 3, with retro knobbly tires, an understated paint scheme, and a new exhaust system with a single pipe on each side—which is probably more practical than the high-set pipes of the showroom machine. A 2007 Scrambler in great condition can be yours for less than $6,000, and a visit to the paintshop and then Coker for new tires will get you started. Shops such as British Customs, who created the exhaust system for the MI3 Scrambler, can provide kit to help with performance. You’ll end up with a sweet classic-inspired ride to put many an SR400 or W650 custom to shame.